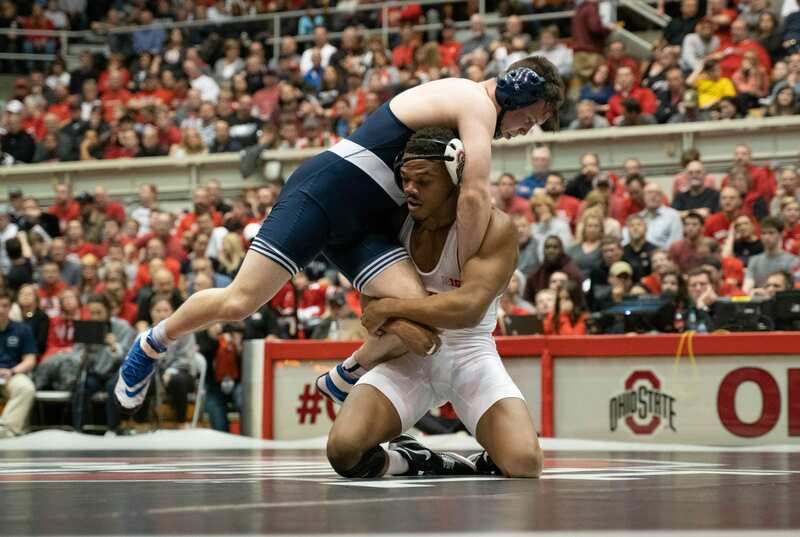 The Ohio State wrestling team will have an opportunity to win its third Big Ten championship in a row when it heads to Minneapolis Saturday to face off in a tournament with nine teams ranked in the top 25. No. 6 Ohio State (12-2, 7-2 Big Ten) will try to defend its title as Big Ten conference champions, but there will also be multiple wrestlers in contention for individual championships. The Buckeyes’ entire 10-man lineup earned top-8 pre-seeds for the 2019 Big Ten championship. Ohio State senior Myles Martin, the No. 1 wrestler in the country at 184 pounds, received the only No. 1 seed for the Buckeyes. Martin is one of only 13 wrestlers nationally to own an undefeated record heading into the postseason. He said winning his first Big Ten individual championship would be meaningful, but he has higher inspirations. Ohio State senior Joey McKenna, the No. 3 wrestler in the country at 141 pounds, shut out his opposition a season ago in the conference championship with zero points allowed. McKenna has never lost a match in a conference tournament and talked about what it means for him to be a No. 3 seed and an underdog this weekend. Ohio State redshirt junior Kollin Moore, the No. 2 wrestler in the country at 197 pounds, could have a chance to avenge his only loss of the season to Penn State redshirt senior Bo Nickal, who is the No. 1 wrestler at 197 pounds and remains undefeated, should they both reach the finals. Nickal has won two-straight NCAA titles and defeated Moore in a dual earlier this season via pin. Moore has never lost a bout in the conference championships his entire career. He comes in as a No. 2 seed and is expected to face No. 1 seed Nickal in the highly anticipated rematch in the 197-pound championship. Ohio State redshirt senior Micah Jordan, the No. 2 in the country at 149 pounds, has never won a Big Ten title, though he has been a finalist in each of the past two years. Jordan has lost just one dual this season, to Rutgers’ Anthony Ashnault, who is the top seed in the Big Ten at 149 pounds. Ryan said Jordan has been training extremely hard for this moment and is ready to shine this postseason. Ohio State redshirt freshman Chase Singletary, the No. 11 wrestler in the country at 285 pounds, is on a roll heading into the Big Ten tournament. Singletary has won three matches in a row, with two of those victories being over nationally ranked foes. Ohio State freshman Malik Heinselman, is heading into his first ever Big Ten tournament as the No. 8 seed. Martin said he has a personal interest in how the true freshman Heinselman performs in his first conference tourney. No. 6 Ohio State will attempt to win its third straight Big Ten title starting at 11 a.m. on Saturday in Minneapolis.